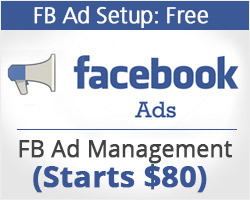 Facebook advertising is the fast growing trend in the online advertisement Industry. With 1.39 billion users classified by age, location, demographics, revenue, education and behavior, Facebook serve a perfect platform to target the right audience with a comparatively lower cost. From page likes to website clicks, they offer a wide range of advertising solutions to suit any business. Businesses that are advertising on other networks now realize the potential of Facebook and have started spending on FB ads. We will analyze your business and have an initial discussion to determine the right Ad type to suit your business. We will initially decide on a single Ad type for eg. Website clicks or a combination of Ad types such as page likes, fan engagement, post engagement etc. Location & Demographic Targeting Setup the ads to run at the right areas and target the right age group in right time. Location targeting involves countries, counties/regions, cities, ZIP/postal codes, addresses or specific areas to display or exclude ads to users in those locations. The ads are then narrowed down to Gender & Age group thus hitting right on target. Identify the potential customer based on their behavior and interest. The ads are optimized to reach users based on purchase behaviors or intents, device usage and more. Create and test stunning Ad images with right call to actions ensuring best click through ratio (CTR). Identify the best performing ads, locations etc. and allocate budget for maximum performance. Re-Targeting Remarket to potential customers who have visited the site by setting up re-targeting pixel at website. Conversion Tracking Implement conversion tracking at website and track conversion, cost per conversion etc. to fine tune the campaign for better performance. FB offers a wide range of advertising options. Based on the nature of business we will choose the right choice(s) of Ad type from the below to target the potential customers. This works similar to Google Adwords. When the user click on the image or link it sends them to your website or a landing page. This help increase conversions on your website which is tracked by implementing a conversion pixel on your website. If you have an important post, say a discount or promotion you can boost your posts. Promote your FB Fan Page and get Page likes to connect with more of the people who matter to you. Get installs of your mobile app. This works like a coupon where you can create offers for customers to redeem in your store. Reach people near your business. Create ads that get more people to view a video.